Are you planning to build a brick-and-mortar store? If so, you need to know that a roof is one of your most valuable investments. When it comes to the specific roofing type, flat roofs are a common choice. Don’t install a flat roof just yet. In this article, you’re going to learn a specific kind of flat roof that ensures plenty of benefits for your business: The EPDM roofing system. What Is Firestone EPDM Roofing and Why Should You Choose This? An EPDM (ethylene propylene diene monomer) roofing system is commonly referred to as rubber roofing. While there are many roofing manufacturers that offer their very own EPDM roofing, Firestone makes an excellent choice. Firestone’s EPDM roofing systems are seamless. Since they come in one piece, roofing contractors get to avoid field seaming. This alone reduces the time and effort it takes for your roofing contractor to install this roofing material. Another reason why Firestone EPDM installation is fast and easy is that it does not require any flame. Instead of using heat, your roofing contractor will have to use a cold-applied adhesive. Not only does this make the installation fast, it also ensures that the process is 100% safe and odor-free. Cold-applied roofing adhesive is a recent trend and is widely accepted for its benefits. Foot traffic is a huge problem that causes damage to commercial roofs. In an effort to prevent damage, what commercial building owners do is that they limit foot traffic on their roofs to a minimum. They only allow specific personnel to go up their roofs. And during extreme weather conditions, these people take extra care to avoid causing roof punctures. An EPDM roofing system by Firestone is flexible and lightweight. Flexibility is a feature that allows this roofing material to be installed even in cold temperatures. This means that you can perform a Firestone EPDM installation all year round. 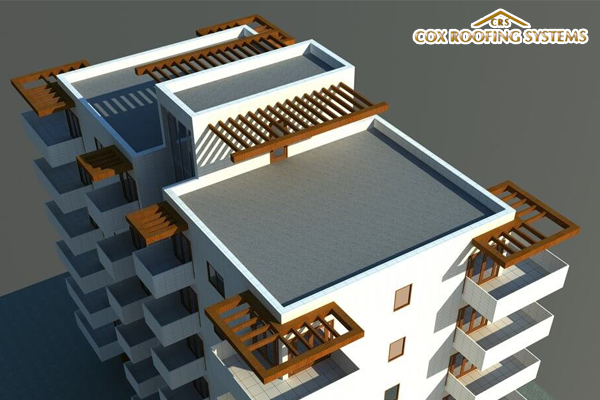 Also, due to its flexibility, this roofing system can withstand excessive building movements. Being lightweight at the same time, EPDM roofing places no stress on your commercial building. If you’re planning to install a garden over your flat roof, consider getting an EPDM roof. They’re highly durable, especially if you choose a thicker EPDM. This resistance against tears and punctures even increases if you prefer to install a TTR (Tri-Thermal Roofing) system, a stronger roofing that combines EPDM and spray-applied polyurethane foam. With the added spray polyurethane foam roofing, all possibility of leaks will be eliminated. A Firestone EPDM roofing system is a reliable barrier against water and moisture. Remember that when water enters your building, other problems occur such as mold, pest infestation, and equipment damage. Did we mention that EPDM material looks really good for your commercial roof? With this roofing system’s clean and smooth surface, it’s hard not to admire it. Now, your roof will look even all throughout and very professional. Your EPDM roof will appear more beautiful with your rooftop garden or solar panels in place. Another aspect to note is that this type of roofing system does not easily show off dirt and prevents the growth of moss that is known to harbor moisture. Because this roofing system resists UV radiation, it will help you benefit from massive energy savings. Hot, southern climates were able to lessen their usage of air conditioning systems. During warmer and cooler months, you do not have to worry about frequently turning on your heating and cooling systems for your employees to work comfortably. When you invest in an EPDM roofing system, you can consider it as a long-term investment for your business. If you install EPDM along with a spray polyurethane foam roof, you can enjoy a much cooler environment. Call this the TTR roofing system. If you want your company to help contribute to a greener environment, consider a Firestone EPDM installation. Yes, you’ll be able to install a rooftop garden (living roof) to further reduce the temperature and improve the quality of air inside your building. The fact that EPDM can be combined with another “green roof” reduces carbon emissions. Firestone’s EPDM manufacturing facilities have also received certification for environmental management system. As one of the environmentally-friendly roofing materials in the world today, EPDM does not have toxic emissions during installation. Did you know that EPDM roofs last up to 50 years with minimal maintenance? By the time this roof reaches its life expectancy, it can be recycled. In Nationwide Foam, Inc’s report, it was mentioned that almost 5,000,000 sq ft of post-consumer EPDM roofing membranes were recycled in the past few years. Moreover, there is no special equipment that is needed to recycle these roofs. Commercial building owners are highly discouraged to install an EPDM roofing system on their own. While Firestone EPDM is a high-quality and sustainable roofing, a quality installation still matters. Firestone manufactures different varieties of EPDM roofing membranes (PondGard, RubberGard, and more). Each of these membranes requires special installation techniques. Cox Roofing Systems is a certified Firestone roofing contractor. As trained and experienced installers, we can promise you a longer-lasting EPDM roof that lets you enjoy the benefits we just mentioned above. Do you have any roofing needs today? We can help you. Contact Cox Roofing Systems.